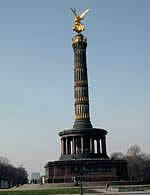 The Victory Column is a famous sight of Berlin. Designed by Heinrich Strack after 1864 to commemorate the Prussian victory in the Danish-Prussian war, by the time it was inaugurated on 2 September 1873 Prussia had also defeated Austria in the Austro-Prussian War (1866) and France in the Franco-Prussian War (1870/1871), giving the statue a new purpose. Different from the original plans, these later victories in the so-called Unification Wars inspired the addition of the bronze sculpture of Victoria, 8.3 meters high and weighing 35 tonnes, designed by Friedrich Drake. Berliners, with their fondness for giving nicknames to famous buildings, call the statue Goldelse, meaning something like "golden Lizzy". Anchored on a solid fundament of polished red granite, the column sits on a hall of pillars with a glass mosaic designed by Anton von Werner. The column itself consists of four solid blocks of sandstone, three of which are decorated by cannon pipes captured from the enemies of the aforementioned three wars. The fourth ring is decorated with golden garlands and was added in 1938/39 when the column was moved to its present location (see below). The foundation is decorated with four bronze reliefs showing the three wars and the victorious marching of the troops into Berlin. They were created by four Berlin sculptors. The relief decoration had to be removed on request of the French allied forces in 1945, probably to prevent Germans from being reminded of former victories in war, especially the defeat of the French in 1871. It was restored for the 750 years anniversary of Berlin in 1987 by the French president at that time, Francois Mitterand. Surrounded by a street circle with heavy car traffic, pedestrians can reach the column through four tunnels, built in 1941 to plans by Albert Speer. 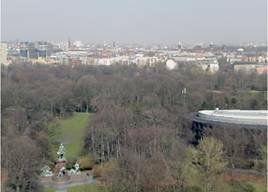 Via a steep spiral staircase of 285 steps, the physically fit may climb up almost to the top of the pillar, to right underneath the statue, for a small fee and a spectacular view over the Tiergarten. 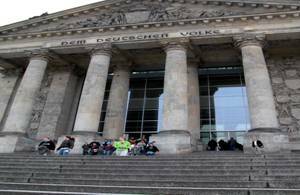 Even many Berliners do not know that originally the column was erected with a height of merely 50.66 meters opposite the Reichstag building. It originally stood in Königsplatz (now Platz der Republik). In preparation of executing the monumental plans to redesign Berlin into Welthauptstadt Germania, in 1939, the Nazis relocated the pillar to its present location at the Großer Stern (Great Star), a large intersection on the visual city axis that leads from the former Berliner Stadtschloss (Berlin City Palace) through the Brandenburg Gate to the western parts of Berlin. At the same time, the pillar was augmented by another 7.5 meters, giving it its present height of 66.89 meters. The monument survived World War II without much damage. 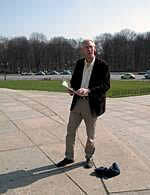 The relocation of the monument probably saved it from destruction, as its old site in front of the Reichstag was destroyed in the war. The Berlin Wall cemented for 28 years the political division of Germany and Europe. It became a symbol of the Cold War, which split the world politically into an eastern and a western hemisphere. Every two years, the Church Congress attracts a city for five days under his spell. More than 100,000 people of all ages, different religions and origins come together to celebrate a feast of faith and reflect on the issues of the day and to discuss. The Kirchentag invites to participate. It pretends not what is right or wrong, but opens up an open and contentious dialogue - or before 1989 in the East-West conflict, during the debates on NATO retrofit in the 1980s or, at present, on the world economy and social justice. The Church Congress is a social forum for discussion and community. The European Union likes to see itself not just as an economic community but also as a community with common values. Yet the question of our still common identity remains unanswered. It is rare to hear European stories about “us”. We have European institutions, trade unions, business associations, parties, NGOs and – of course – associations of churches. However, something that has been almost entirely lacking so far is regular meetings of European Christians committed to civil engagement in society. Although a common public agenda has emerged in Europe in the last few years, precisely due to the economic and financial crisis, this agenda is not being tackled by an alert civil society as a joint project. Instead, nationalism and extremism are on the rise in many EU member states. It is worth remembering that the peace and reconciliation project called Europe was initiated and taken forward by Christians. Many Christians still feel particularly responsible for Europe today. A united Europe is the precondition for shaping our common future in the light of human rights, social justice and cological sustainability. Members of the German Protestant Kirchentag community regard the idea of inviting Christians from the whole of Europe to gather together as a great opportunity. "There are many people in the world who really don't understand, or say they don't, what is the great issue between the free world and the Communist world. Let them come to Berlin ..................... There are some who say - there are some who say that Communism is the wave of the future. Let them come to Berlin ............................ And there are some who say in Europe and elsewhere we can work with the Communists. Let them come to Berlin ................ And there are few who say that it's true that Communism is an evil system, but permits us to make economic progress. Lasst sie nach Berlin kommen. Let them come to Berlin .................. Freedom has many difficulties and democracy is not perfect, but we have never had to put a wall up to keep our people in, to prevent them from leaving us .........................."
On the 9th of November, 1989, the Border separating Western from Eastern Germany was effectively opened and paved the way for German reunification. In September 2013, Ms. Merkel has won the third term as chancellor. That means her agenda will dominate Europe's crisis response for years. The euro's survival hinges to a considerable extent on whether her strategy works. Her approach is to put the onus on struggling nations to save the euro by cutting their budget deficits, labor costs and welfare. It is a strategy that is as popular in Germany as it is divisive in Europe's weakest countries. Critics warn that years more of such cuts could do lasting damage to the economies, social fabric and political stability of weak nations. On this, Katinka Barysch, director of political relations at Allianz SE, wrote 16 December 2013 'What Germany's new coalition government means for the EU': Almost three months after the general election in September, Germany finally has a new government. In a grassroots referendum, members of Germany’s Social Democrats (SPD) voted to accept a coalition agreement that party leaders had drawn up with Angela Merkel’s Christian Democrats (CDU) and its smaller, more conservative sister party, the Christian Social Union (CSU). The new government is unlikely to change EU policy a great deal. In German, the coalition agreement is called Koalitionsvertrag, or coalition treaty. Germans like treaties and other rules that bind. But Germans also know that coalition agreements do not necessarily bind the politicians that sign them. Few of the big decisions that have shaped German politics in recent years were included in coalition agreements; for example the decisions to send troops into foreign wars, abolish conscription or shut down all nuclear power stations were not. The last coalition agreement of 2009 said nothing about the euro crisis. Therefore, the new coalition treaty should be taken for what it is: a declaration of intent and a snapshot of what the three parties involved are thinking at the moment. Even bearing this in mind, the European policy chapter of the new agreement will inspire few people. The three parties make a strong commitment to the EU (“European integration remains our most important task”) and to the euro (“Germany stands by the single currency”). But like the rest of the text, the Europe chapter often papers over conflicts by simply adding up positions: we want fiscal consolidation; and growth. We want a stronger Europe; and subsidiarity. We want more solidarity; as long as countries take responsibility for their own problems. And so on. June 2014, ECPR Standing Group on the European Union, organized the 7th Pan-European Conference on the European Union, which takes place in The Hague, the Netherlands and papers are invited that discuss all aspects of European integration. The paper "Europe ahead though Germany?" brings current aspects and dilemma's under the attention, tries to contribute to enhancing insights, guides a basis for a possible other direction and argues that strength of European integration depends on German control and citizens of Europe. Europe is searching for direction. Economic boom has peaked and European integration seems to get in the way. The European dream seems gone: there is a hugh debt, France reforms too little, Europe's periphery (Greece, Spain, Italy, Central Europe and Eastern Europe, Baltic States) is fragile, populism, nationalism, technocracy is in front and there are seccession desires (Scotland, Belgium, Basque country). An unpleasant aspect are Russia's strategic games. The SPD’s influence is visible in a lengthy section about the need to strengthen the “social dimension” of the EU. However, the only tangible measures in this respect are German help for neighbouring countries that want to improve their apprenticeship systems (this started under the last Merkel government) and the drawing-up of an EU social “scoreboard”. This scoreboard (a Commission idea) would be an attempt to feed warning signs of high employment and social pain into the EU’s strengthened fiscal and economic surveillance. It should not come as a surprise that the coalition agreement largely perpetuates Germany’s euro policies of the last four years. First, when it comes to euro crisis management, Germany has effectively had a grand coalition since 2010. In her last government (a coalition with the liberal FDP), Angela Merkel was faced with a small but persistent anti-bailout rebellion within her own ranks. Therefore, she had to rely on the SPD to pass almost all big euro-related measures in parliament. Therefore, Germany’s euro crisis management was already to some extent a compromise between the CDU/CSU and the SPD. Third, German voters overwhelmingly support the cautious course that Merkel has charted in the crisis so far. For the SPD to demand a radical departure would have been politically risky – and hard to sell now that most Germans think the worst of the crisis is behind them and finally, the past four years have taught German politicians that it would be foolish to lay down either ambitious goals or rigid red lines at a time of crisis. As long as the eurozone looks shaky, German politicians will want to have a large degree of flexibility to react to developments. For some, the fact that the coalition programme is rather vague on EU policy will be disappointing. But this vagueness will allow the new German government to react flexibly if there is renewed instability in the eurozone. Zum Abschluss seines Staatsbesuches in Frankreich (2.-8. 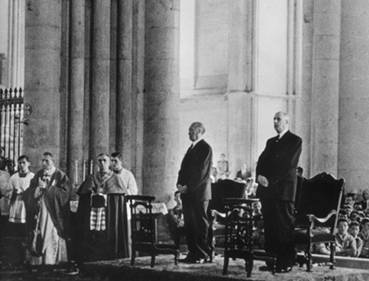 Juli 1962) besuchten der deutsche Bundeskanzler Konrad Adenauer (links) und der französische Präsident Charles de Gaulle (rechts) eine katholische Messe in der Kathedrale von Reims. Due to the celebration in 2012, Bundeskanzlerin A. Merkel and President Hollande represented their countries. Die Wahl des Ortes als Symbol der Versöhnung war auf mehreren Ebenen besonders bedeutsam: In Reims war der Merowingerkönig Chlodwig getauft worden; zudem wurde hier Ludwig I., der Sohn Karls des Großen, gekrönt. Die Kathedrale war deswegen über Jahrhunderte der Krönungsort der französischen Könige. Im Ersten Weltkrieg wurde die Kathedrale durch gezielten deutschen Artilleriebeschuss schwer beschädigt. Schließlich war Reims auch der Ort, an dem die deutsche Wehrmacht am 7. Mai 1945 kapitulierte. Friedrich Nietzsche wrote in his book 'The Gay Science' (German: Die fröhliche Wissenschaft from 1886) about the old problem: 'What is German?' and refers to Leibniz' 'the consciousness is only an accidental feature of the show, only one state of our spiritual and psychic world and by far not the world itself. ', Kant's impressive mark behind the notion that he placed causation and Hegel's argument that conceptions are developed from each other. He defines: 'German? Yes, without a doubt. In all three cases we feel something of ourselves and guessed and are grateful for that and surprised at the same time, each of these three propositions is to thoughtfully provoking piece of German self-knowledge, self-experience. Our inner world is much richer, more comprehensive, more hidden, so we find with Leibniz; as Germans we doubt with Kant the absolute validity of scientific knowledge and in general to everything that is there in connection: the knowable seems to us as such already lower value. We Germans are Hegelians, even if Hegel would never have existed, in that we (unlike all the Latins) assign to 'to be' a deeper and richer sense than to what we believe 'ís' - hardly the justification for the concept of 'being' - also in so far as we are not inclined to admit our human logic, the logic that they themselves, the only kind of logic would be. Brave politics and cheerful patriotism, that without hesitation measures all things to a little philosophical principle and from the perspective of the kind, namely the German species, considers, clearly testifies to the contrary. No! The Germans of today are not pessimists! Question: Mr President, at a meeting with historians at the end of last year, you asked a rhetorical question: “What was wrong with the Ribbentrop-Molotov Pact?” Recently, Minister of Culture Mr Medinsky, called this pact a triumph for Stalin’s diplomacy from the point of view of the Soviet Union’s state interests. Such words stir fears in Poland and the Baltic states. Yesterday, at the parade, you spoke of the need for a new security system. How can we build a system that would take into account the interests of Poland, the Baltic states, Moldova, Georgia and Ukraine? What can Russia and Germany do to assuage these nations’ fears? Vladimir Putin: This is the sort of question that we could discuss all night long. But when it comes to assuaging fears, this also has to do with the internal state of those who have these fears. They need to step over their fears, move forward, stop living with the phobias of the past and look instead towards the future. Concerning the Molotov-Ribbentrop Pact, let me draw your attention to the historical events, when the Soviet Union… It is not even so important who was in charge of diplomacy at the time. Stalin was in charge, of course, but he was not the only person thinking about how to guarantee the Soviet Union’s security. The Soviet Union made tremendous efforts to put in place conditions for collective resistance to Nazism in Germany and made repeated attempts to create an anti-Nazi bloc in Europe. When the Soviet Union realised that it was left to face Hitler’s Germany on its own, it acted to try to avoid a direct confrontation, and this resulted in signing the Molotov-Ribbentrop Pact. In this sense, I agree with our Culture Minister’s view that this pact did make sense in terms of guaranteeing the Soviet Union’s security. This is my first point. Second, I remind you that after the Munich Agreement was signed, Poland itself took steps to annex part of Czech territory. In the end, following the Molotov-Ribbentrop Pact and the division of Poland, they fell victim to the same policy that they tried to pursue in Europe. We need to remember all of this, not forget any of it. If you paid attention to what I said yesterday, I said that a truly effective security system must be built not on a bloc basis, but on the basis of an equal approach to security for all actors in the international community. If we could build our work on these principles, using the United Nations as a base, I think we would achieve success. Question: Mr President, how do you view the fact that the German leader has come to Moscow today, the leader of the country that we fought against during the war, but the leaders of the other nations in the anti-Nazi coalition did not come? I spoke with German journalists today, and they say that deep down, you surely feel offended by this. Is this the case? Vladimir Putin: Regarding the tragedy that was the war, our country fought not against Germany, but against Nazi Germany. We never fought Germany, which itself became the Nazi regime’s first victim. We always had many friends and supporters there. Yesterday at the parade, if you recall, I said this too. Many people of different political persuasions ended up in concentration camps and lost their lives. 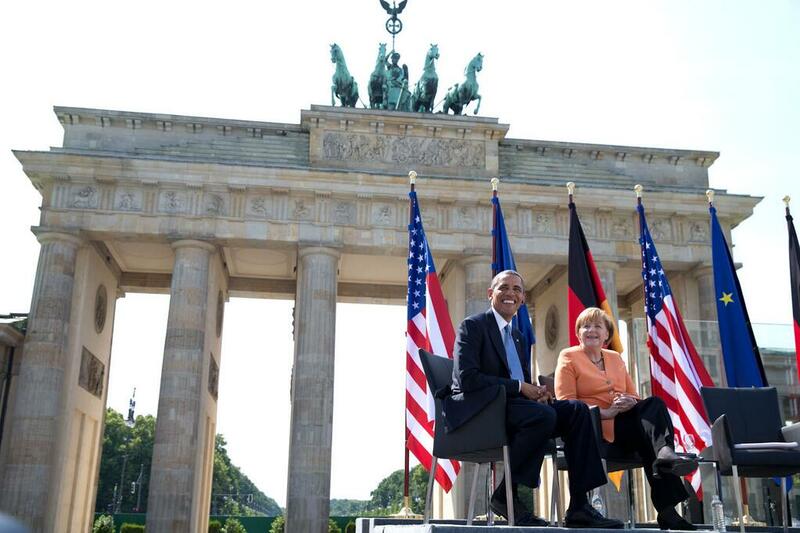 We see today’s Germany as our partner and a friendly country. I think it is natural that the Federal Chancellor should have come to Moscow today. As for the leaders of other countries, including the countries in the anti-Nazi coalition, this is their choice, their decision. I think that current political considerations are less important in the end than the more fundamental issues of maintaining global peace and preventing a repeat of the past catastrophes, if we remember the disaster of World War II. But this is their decision. You know, yesterday at the reception, veterans from the Unites States, Britain, Poland and several other countries came up and thanked me for all that was done during the war. They are the main participants in these celebrations, and I was very happy that they were here together with us. Question: Mr President, this is your first meeting since the marathon negotiations in Minsk. You said that the diplomatic process has stalled somewhat, and that at the same time, military action has resumed and people are again being killed. Although weapons were supposed to have been withdrawn, the separatists often say that new attacks have taken place. Ms Merkel spoke about President Putin possibly using his influence on the separatists. Why is President Putin not using his influence more boldly to give this diplomatic initiative a chance? Vladimir Putin: First of all, we need to have some common criteria for assessing and responding to events taking place in the world, a common set of rules. Look at what is happening in Yemen and what we are seeing at the moment. A coup took place there and the president stepped down. Now, other countries, with which Russia has good relations, want to return him to power, and everyone is calling this a coup. After the coup in Ukraine took place, we heard goodness knows how much venom heaped on former President Yanukovych, and saw all manner of support for those who carried out the coup. If we apply different standards to the same kind of events, we will never be able to agree on anything. We need to abandon the ‘law of the strongest’ and ‘rule of the fist’ in international affairs and base ourselves instead on norms of international law that the entire international community accepts, understand in the same way, applies and defends.